Your Grandma, Nana, Mom and even Auntie can proudly show off the whole family on attractive Personalized Grandma Shirts. She has a heart made of gold that fills her children & grandchildren with love. She will shine brightly when she wears this beautiful Personalized T-shirt. Your personalized t-shirt is available on our premium white 100% cotton T-shirt, machine washable in adult sizes S-3XL. Includes FREE Personalization. 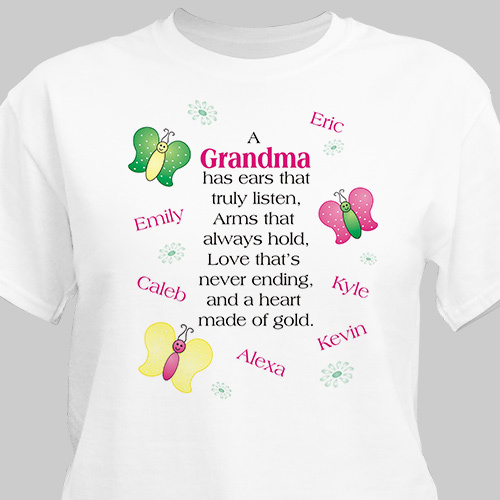 Personalized your Grandma T-shirt with up to 30 names & any title. Loved the shirts. You guys can make any occasion special! Everyone who sees my shirts,want to know where I get them.Of course I tell them & share the web site. They should be line/ air dried.100% cotton. The design of the shirt was cute, but you have to be really careful when ordering. Because the shirt is a man's shirt and not a woman's shirt. So, you have to order a smaller size then what you would mormally get in a woman's size.